This quote made me think. The concept of thinking is always scary, but usually it leads to some interesting revelations on business and life. In this case the light bulb went off regarding business and blogging. When it comes to business it is the job of the owner or in some cases the marketing department to facilitate the handshake between business and customer. While it’s convenient for the marketer at the business to sell the product to the customer it does need to start with a good product. Focusing on the merchandise or the service has always been something great companies have done. You need to start with something useful and from there move forward with getting the handshake. If you have a service people want there is opportunity to facilitate the initial handshake with your customer by blogging. You need to get here. Courtesy of buddawiggi. New customers are important for business. You can focus all you want on loyalty, but you can only squeeze so much juice from an orange. In order to grow your company you need to bring in new customers and you likely need to do more of this each year in order to grow. Most businesses have a certain percentage of customer churn. Depending on the nature of your business model this percentage varies, but over a few years the percentage of churn in your business should be evident. As the owner of the business you want to add new customers to not only make up for the lost customers each year, but you want to bring in more new customers than lost in the previous year. Obviously, this is what growth is for a business. For certain businesses, typically those in the service industry, a blog can bring in new customers. Blogging Creates Discovery – The first goal for your company in its pursuit of new customer is to find customers. Once you have an idea of where your customers are you need to introduce your business to them and get the interested. There are two ways to do this. First, you can find where your customers are spending their time and push messages on them. Second, you can figure out when your customers are looking for information and make sure you have information ready for them to find. Today, more companies are focusing on the latter because it yields better results in the long run. The reason the first model is still bigger is because the second is much more difficult. The second requires effort to create content that will be searched for and shared. Blogging Builds Trust – The second goal once you have the attention of your target customer is to get them to trust you. This is the part where a customer knows about you and your business, but they are still unsure if they even want to meet with you. They hang back and wait to learn more about you. They check with peers and ask questions. Blogging builds trust. By writing narrative on certain topics you provide your customer with a chance to get to know you. 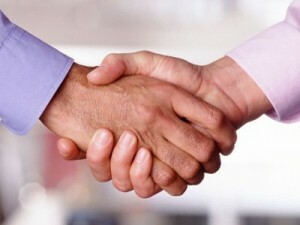 People connect with people and in order to get to the handshake you need to earn a level of trust. A blog gives the customer something to attach to and understand. Once trust is earned and the customer is convinced that there may be potential for a mutually beneficial relationship they reach out for a handshake. It’s much better for the customer to reach out with the first hand in the shake. Those are the customers that truly want your service. Those are the customers that convert. They are hard to earn, but as more companies are realizing today it’s a blog that can facilitate the handshake between business and customer.